For more than 6 decades Nason has provided pneumatic and hydraulic pressure devices to the industrial, military, and mobile hydraulics fields. Over a decade ago, Nason took the knowledge gained from designing and manufacturing custom devices for harsh environments, limited space requirements, and quality, long life products and applied it to our newest product offerings, Pneumatic and Hydraulic Automation Products. Nason’s pneumatic and hydraulic automation products feature a standard amount of power in a much smaller, more efficient package. Nason cylinders come with an aluminum or stainless steel housing, custom drilled to match your exact specifications. Every part of the cylinder is assembled with your needs in mind. 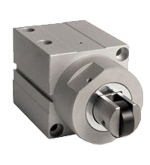 Each is designed to minimize breakaway and running friction, promoting efficiency and longer operational life. Nason's line of transducers features a number of innovative technologies, including a low current consumption design for our digital models. Their standard transducers come in a compact, economical design that can nonetheless accommodate a variety of ranges and outputs, depending on your needs. Nason transducers are highly accurate and come in four accuracy models, ensuring precise conversion regardless of harsh operating conditions. These low-cost, high value products are all OEM tested and approved. Clayton Controls is a Nason distributor in California. We offer technical support to help our customers solve their applications.